My brains are fried. Fried I tell ya. How come? Fitted. Sleeve. Cap. Ever since yesterday, I have got Fitted Sleeve Cap on my mind. With ever step I take, with every move I make, Fitted Sleeve Cap is on my mind. 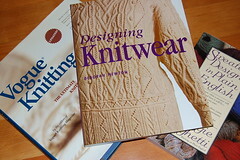 I found interesting articles over at knitty.com about sleeve caps, I pulled out my books Vogue Knitting, Sweater Design in Plain English by Maggie Righetti and finally Designing Knitwear by Deborah Newton. I read and read, tried to understand that bell shaped fitted sleeve cap but to no avail. I could not wrap my brain around it and walked away frustrated. After walking back and forth to the books and my project, I sit still, close my eyes and try to see that whole fitted sleeve cap thing in 3-D. The bell shapes I see in the books do not make sense to me, they are too flat so I pull out my 3-D imagination. In my mind, I shape the bell form of the fitted sleeve cap and gently fold it over my shoulder in order for it to fit my armhole. With that image in my mind I draw out the fitted sleeve cap, cut it out and fold it. Now I can view it from every angle. Phew… it finally makes sense to me! And now comes the knitting part… Wish me luck! I was horrified, I tell you, when I entered a certain artistic event last Sunday… Nothing, absolutely nothing whatsoever was slightly aesthetically appealing to me. I realized that I was totally outside of my realm, and I am sure that I stuck out like a sore thumb. There were several photographers documenting the event, shooting left and right, running from one art piece to another, laughing and talking to the artists. And me? I stood there at the border watching it all go by, my camera hanging untouched around my neck. Allthough the event was not my cup of tea, who am I to judge and/or denounce a certain type of art? What is aesthetically pleasing to me, does not have to be aesthetically pleasing to someone else and vice versa. Live and let live, artists rule, whether I like their art yes or no. I am so incredibly pleased with both projects I am working on! Lady Eleanor is flying off of my needles, growing and growing, and where ever I sit and knit, people come up to me to shower Lady Eleanor with oohs and ahs. Imagine what the effect will be when I elegantly drape her over my shoulders and I enter into a room? Only three more balls out of the ten I started with and she will be done! And now my choli project… Do I have fun making this..! 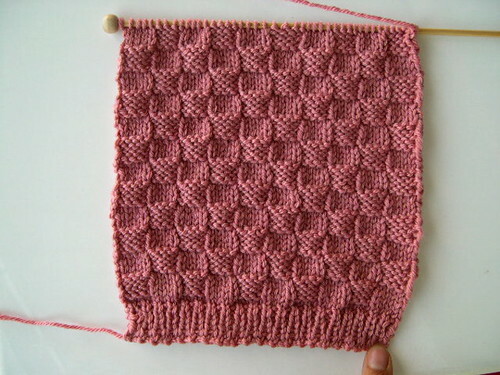 The math, counting the stitches, calculating when to increase or decrease, viewing the design from a middle point, then knitting it from right to left and then writing the pattern down from left to right… LOVE IT. Today, as I was happily working on it, I stopped in the middle of calculating something and said to myself: Nancy, you are actually designing. Scream! 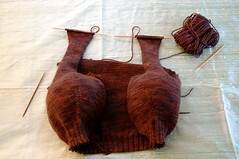 And now I have to knit the sleeves and sleeve caps …gulp… But I know I can do it… I will figure it out! 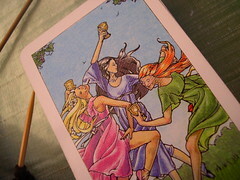 Grab that Cup filled with Opportunities… and by all means drink… drink and dance!!! Just a few weeks ago, I experienced the hot summer days as long and drawn out with no end in sight… but then suddenly that all changed. 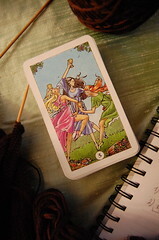 Several opportunities have arisen which have catapulted me into a whirlwind of (non-knitting) projects. So… yes, I am very busy lately. Days fly by before I can even blink my eyes, I am running from one project to another but my God, am I ENJOYING it! I know, I know, I still have to post that pdf file of the Seattle fingerless glove pattern… I love making my own patterns, but boy, the writing sure is boring… I get to it asap, I promis! 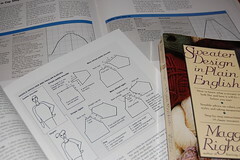 As far as I know, there is no published knitting pattern available for a choli, so I am making one myself. Quite a challenge for a novice knitter, but I am learning so much! The Yarn that I am using is Sirino in colorway Capuccino from the brand Great Adirondack. 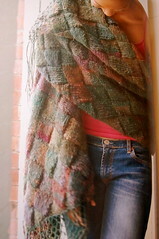 Merino wool and silk…It is so yummy! It is really an adventure for me and I don’t know what the endresult will be. I shaped the boobies (yay! 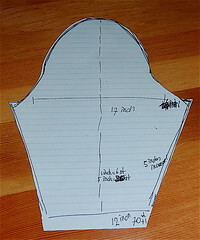 ), the neckline and armholes and am now ready to shape the back neck line. I cannot tell you how much I am loving this! There is a lot of ripping out, but hey, nobody said it was going to be easy. 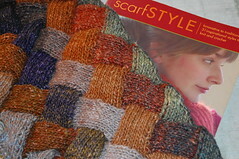 My second project is Lady Eleanor from the book Scarfstyle by Pam Allen. 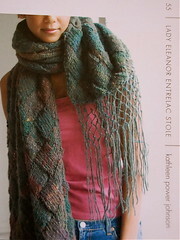 The designer of Lady Eleanor which can be found on page 55, is Kathleen Power Johnson. 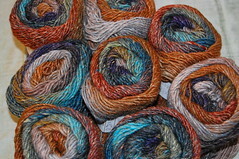 I am using Noro Silk Garden colorway 245. It’s gorgious… I love it! That’s it for today… may your days be adorned with Cups filled with Opportunities… all you have to do is just reach out and grab it! 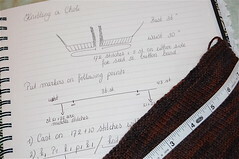 Needle size: 3 – PLEASE NOTE THAT I AM A TIGHT KNITTER SO YOU MAY WANT TO USE A SMALLER NEEDLE TO OBTAIN GAUGE! Cast on 42 sts. Make sure you have about a 15″ tail ( for seaming later on). Start with 6 row k1,p1 ribbing. Now look at your work. 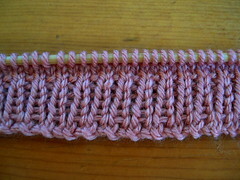 When facing RS , you will see two rows of KNITTED stitches. So this is your Right Side! 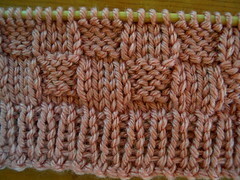 When facing WS you will see two rows of PURLED stitches. Row 1 to 8 form the pattern. Repeat 5 more times so in the end you will have 12 squares counted from top to bottom. 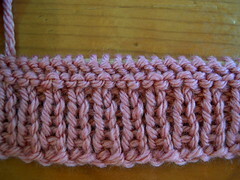 Notice that the outer border stitches (the very first and the very last ) are KNIT when RS if facing you. When WS is facing you the very first and the very last stitch are PURLED. Why is this? It will make the seaming later on much easier. Almost there! 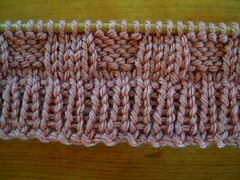 Make 4 rows of k1, p1 ribbing and bind off loosely in ribbing pattern. Make sure you leave a 10 inch tail when you cut off the yarn. If you don’t know how to seam, go to knittinghelp.com and watch Amy Finlay’s excellent video tutorial on the mattress stitch. 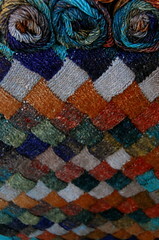 Scroll down her page untill you hit the “finishing” section and click on the mattress stitch! The BOTTOM of your glove are the first 6 ribbed rows, the TOP of your glove are the 4 ribbed rows. Make sure that when you fold the glove in half that the Right Side is facing you! Now with the tail end at the bottom of the glove, start seaming up for about 4 inches. If all went well, you should have an opening for your thumb that is about 1 1/4 inches wide. It is all up to you where and how big exactly you want that thumb opening to be. Please know that making a picture tutorial takes up a lot of hrs! You are currently browsing the Getting Purly With It blog archives for August, 2007.